At the time, Khodorkovksy was riding high, sitting at the top of his Yukos Oil operation after having spent several years carefully building an international profile – first at Bank Menatep and subsequently at Yukos. Khodorkovsky was not yet 40 years old, and had the confidence/arrogance both of a young man who had not experienced defeat, and always knew he was the smartest guy in the room. Sometimes it served him well, and he could appear charming, with almost boyish naiveté. Once, at lunch – we actually were in Switzerland – he was excited about the choices on the menu and his high-pitched and halting English (which he rarely used) was fairly engaging. At other times, he was almost playful when he discussed his status in Russia’s business hierarchy. “I’m an oligarch, I can make anything happen,” he said with a smile while assuring a visitor than he could get a third person to show up at a specific time and place. And he verged on being professorial when he took out a small black-covered notebook and began diagramming the highly criticized transfer-pricing strategies used by his company. Despite that, a darkness sometimes associated his comments, such as the time – in the middle of a business conversation – when he leaned over to his colleague Leonid Nevzlin, whispered in his ear and began laughing. The joke, it seems, was the manner in which he and Nevzlin had dealt with a particularly troublesome associate. Saturday afternoon lunch at his dacha also was an adventure – a handful of us sitting around a massive rectangular table. Surrounding us were bodyguards equipped with AK-47s. A ride in his car also was a once-in-a-lifetime event: the heavily reinforced lead doors so thick (and bullet-proof) that one could barely close them. In the end, though, the thing that ends up being most memorable was his intense interest in politics, even when he knew – and acknowledged – that it wasn’t a good idea. He willingly made introductions to other reformers, and he thought about proactive tactics – such as assertive op-eds and leaking information to the media – that clearly had danger associated with them. He was arrested in 2003, convicted in two trials, and sat behind bars for 10 years. Menatep is gone and Yukos is gone. 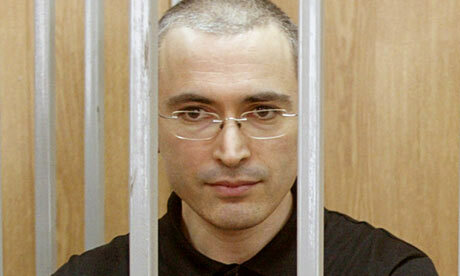 Khodorkovsky stopped being an oligarch a long time ago. He stopped being a prisoner today. Posted in Uncategorized and tagged Khodorkovsky, Menatep, Yukos on December 21, 2013 by John Jones.